The Red Crossbill is a bird species that is often referred to as enigmatic; this is accurate in more ways than one. This is a rather nomadic species that sometimes wanders long distances in search of food. Unlike your typical boreal irruptive species that typically move more-or-less south during fall/winter when their local supply crashes, both Red and White-winged Crossbills may move in any direction at any time of year in response to changes in abundance of their preferred conifer seeds. Red Crossbills may even breed in any season of the year if they deem their current food supply and habitat to be sufficient. Thanks to that complex situation, the species' movements can be difficult to predict even with an intimate knowledge of their biology. If you think that's interesting, there's more. They are just as enigmatic with regard to taxonomy as they are with their movements. Red Crossbill is a widespread Northern Hemisphere species that occurs in North America, Central America, across Eurasia, and even into extreme northern Africa. Here in North America, ten different "types" of Red Crossbill have been described in recent years. These types differ by flight call and often by bill and body size as well. What this means in terms of speciation is currently unclear. Do some or all of these call types represent distinct species? Perhaps. How plastic is the call type of an individual bird? How long ago did each type begin to diverge from another? What do the genetics tell us about their relationships? Where does each call type occur? How much breeding occurs between these types where they overlap? Today's field birders have two options. One...you can go on recording your sightings as Red Crossbill and not worry about what type you are seeing. Identifying a bird to type takes extra time and work (= hassle, to most people), as you'll see below. And, at least right now, there is still officially only one species of Red Crossbill to worry about anyway! Two...you can contribute to the growing knowledge of Red Crossbill status and distribution by identifying birds to type and reporting them as such to eBird. Option two is way more fun! I don't personally care whether or not any of these "types" are given full species status someday. 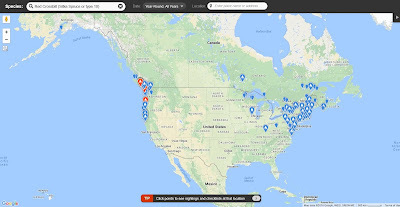 It is fascinating enough to figure out which types I'm seeing and, in the case of Connecticut where Red Crossbill is not a resident species, from where they might have come. If you do some reading on the subject, you'll see that each call type has a core range, particular pattern of dispersal/wandering, and preferred conifer species. Here in Connecticut I began to take an interest in Red Crossbill types during the winter of 2007-08, when a sizeable invasion took place. My recordings along the coast revealed mostly Type 10 with a couple Type 3 among them. Fast forward to late autumn 2012 during another major crossbill invasion. Again taking recordings on the coast, where crossbills were concentrated as they moved in search of food, I recorded solely Type 3 birds. Indeed, Types 3 and 10 are known to be highly irruptive and seem to occur here at a much higher rate than the others, at least since folks have been going to the trouble to ID these birds to type. Pretty interesting that Type 10 dominated the 2007-08 invasion, while Type 3 dominated the 2012-13 push. Again, these were large-scale movements noted throughout the northeast and beyond. I was intrigued by the reports of Red Crossbills in the vicinity of Benedict Pond in Norfolk, CT that began on September 10th. This location is a stone's throw from the Massachusetts border in northwest CT. People were seeing up to a dozen Red Crossbills and a single juvenile White-winged Crossbill over the ensuing days. How long they had been there, who really knows, as this is not a heavily birded location. A couple things made me wonder whether these might actually be a different type of Red Crossbill. First, the time of year. September 10th is a bit early for Red Crossbills to appear during a typical invasion year. Second, the location...far northwest CT only. No sightings along the coast yet, which is where invading crossbills tend to concentrate when they hit CT. Third, I had not heard or read anything on the interwebs about a crossbill invasion beginning anywhere nearby. 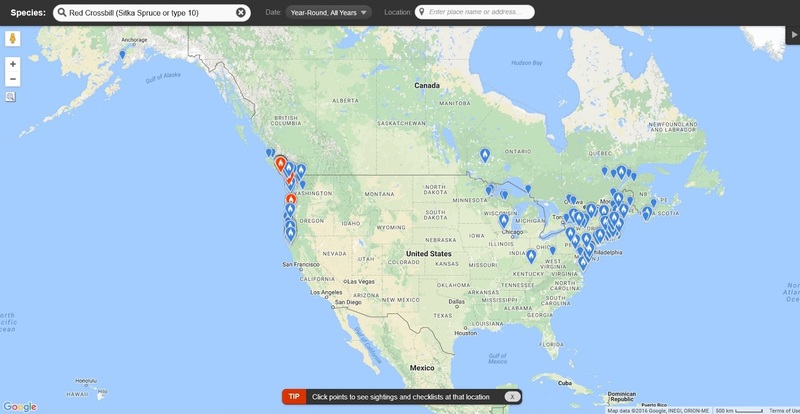 Connecticut is usually not ground zero for an invasion event; you can often "see" the birds coming, as eBird reports pop up to our north or west and the internet begins to chatter about those sightings. So, your classic crossbill appearances in CT (such as those in 2007-08 and 2012-13) tend to go something like this: reports trickle in from our north/west, birds arrive in CT in Oct-Dec, and they are mainly seen along the coast. Since the Benedict Pond birds did not fit that mold, my interest was piqued more than usual. I managed to catch up with a few of these birds on September 20th. Views were poor, but they were very vocal as they made a few passes overhead in groups of 1-3 birds. I was able to record three of these flyby's using my iPhone. 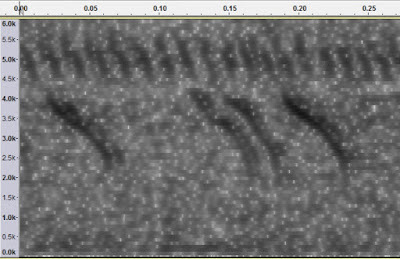 Spectrogram analysis of the first segment revealed TYPE 2 - indeed different than the highly irruptive Types 3 and 10 that are usually seen in southern New England during invasions. The Type 2 Red Crossbill, nicknamed the "Ponderosa Pine Crossbill", is a very widespread type. It could conceivably turn up pretty much anywhere in the country. The heart of its range lies in the western United States, and it appears to be uncommon in the east. Despite its nickname, this type is also a bit of a generalist when it comes to conifer preference, although it does particularly well with hard cones such as those of the Ponderosa Pine. All current eBird reports of Type 2 Red Crossbills. While hardly comprehensive, this gives us an idea of their distribution. Common in the west, scarce in the east. 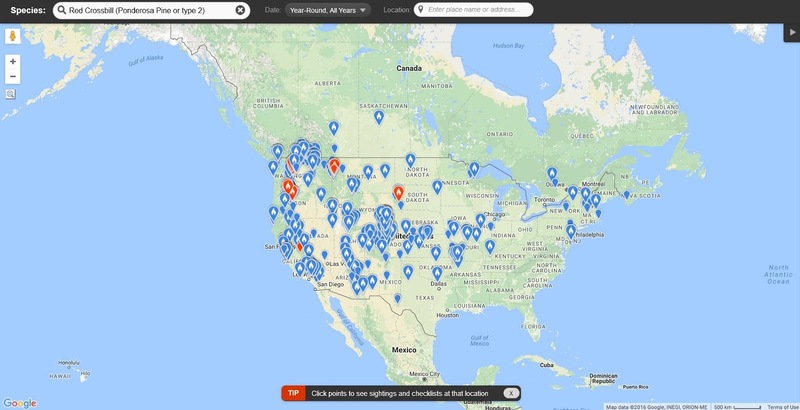 There are no eBird reports of Type 2 birds from Connecticut. I am unsure whether or not there are any previous records at all. A few days later I resumed analysis, this time listening to the other two, lower-quality recordings. One of the segments held more TYPE 2 flight calls, while the other segment sounded higher pitched and sharper. Spectrogram analysis of this higher-pitched call left me at a complete loss! I had no idea what I was hearing or looking at. Definitely higher frequency, as confirmed by spectrogram, but not a classic match for any type I could find in my own research. I emailed Matt Young, resident crossbill expert/researcher at Cornell, for assistance. Matt informed me that this call was a variant of TYPE 10. It is higher pitched, like your classic Type 10 call with which I became familiar in 2007-08, but a bit rougher sounding to the ear due to the sharply descending part at the end. Fascinating. Matt notes that Type 10 is a particularly variable call type. And it is apparently the most common type in the northeast. All current eBird reports of Type 10 Red Crossbills. Again, with RECR type discovery and the eBird revolution both being recent events, this is just a snapshot. So, at Benedict Pond in Norfolk, CT we have two types of Red Crossbill and a White-winged Crossbill; that's wonderful diversity especially since we aren't talking large numbers here. I think the highest one-time count has been of a dozen birds, though who knows how many are actually roaming this area. The pine crop sure seems abundant enough to hold many more than that. The winter finch season is still plenty young. We'll see what else develops over the next few months. I'll update this space as needed. For anyone interested in reading more about this ridiculously perplexing species, check out Matt Young's Red Crossbill primer. You can record these birds in many ways, but the easiest (for me) was simply using my iPhone. No accessories needed. All you need is a recording app, one of which is included with the phone, though it is meant for voice memos. I use an older recording app called "Fire" which may no longer be available for download, and I produce spectrograms with Audacity. If you make a recording and would like to do the analysis yourself, feel free to email me with questions and I can describe my process in detail. But if you aren't inclined to go through all that work, you can send your recordings to Matt Young, and he will help you out as his time allows. Fire is now Rode Rec, and the Lite version is still a free download. Coupled with a cheap shotgun mic such as the Audio Technica ATR 6550, Rode Rec on the iPhone is a pretty capable recording outfit.